I've been doing this String Calculator Kata whenever I've had a spare half hour before 7am and wanted to see how others did it. See the Andrew Woodward Calculator Kata and the Bobby Johnson Calculator Kata. It was more than a little odd to see tests pass using the ReSharper Test Runner but fail when using either NUnit or the as yet mystery default option (whichever is used when Test With > Debugger is selected from the context menu). Reason being that ReSharper is kind enough to run the tests in the order they appear whilst the others do so in alphabetic order. Dependencies between tests become apparent. Slaps to the forehead are delivered. We resolve to steer clear of using statics for unit testing. With only one monitor at work - everyone has just the one monitor so we're not too keen on standing out for being flash by having two monitors! 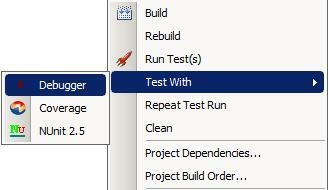 - it would be handy having test results appear in the status bar using an ALT-T shortcut and TestDriven.NET. However, licensing! So it's tabbed Unit Test Sessions and CTRL-TAB until we're in the promise land. Also, it turns out the the advertisement for going mouseless is true. Keeping the hands on the keyboard does indeed speed up coding. The next problem then was trying to access the Debug Tooltips (available ordinarily by hovering the mouse over variables). The solution is AutoHotkey and the script is courtesy of Rob Henry. Bloomberg connectivity is a riot. We submit (by FTP) a text file with an expected format using carriage return and line feed to separate data entity requests. From C# this means shelling out to a batch file (remember DOS) which executes some Java code responsible for handling request/response. If the request is valid then one minute later a zip file is returned that contains a text file. We parse and we have a database ready data file. If the request is badly formed, however, then an error file is created on the remote FTP directory but that is never returned! Five years ago someone asked on Willmott (serving the Quantitative Finance Community) how to connect a Java application with Bloomberg to send and receive data. Dominic Connor was kind enough to reply. At another time, at another place we used the DLLs on the Bloomberg terminal to return the data we needed. It was fast, efficient, predictable and illegal. Good times. Take this feed, for example, which is the RSS for a useful post on Volatile vs. Interlocked vs. lock. In order to to be able to use XPath with XDocument to retrieve the question we rely on XmlNamespaceManager. The volatile modifier is usually used for a field that is accessed by multiple threads without using the lock statement to serialize access. Using the volatile modifier ensures that one thread retrieves the most up-to-date value written by another thread. Unfortunately, I can't find this specific RSS item within the Technology feed and the same is true for the RSS feed for this blog. Although it's possible to score a reference to the item if it appears within the list of entries as they each have a unique ID, should the category contain too many entries then the older posts don't show up. Soon I'll show why this might matter but I digress. A solid handle on this C# Threading series of posts might just be enough (for now). The real trick, however, might be recall during interview. There's definitely a theme here.